C. Servilius C.f. was one of the moneyers for the year 57 BC. He is not otherwise known. Gens ervilia was a patrician family at Rome. The gens was celebrated during the early ages of the Republic, and the names of few gentes appear more frequently at this period in the consular Fasti. It continued to produce men of influence in the state down to the latest times of the Republic, and even in the imperial period. 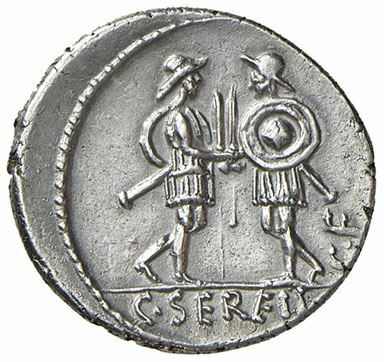 The first member of the gens who obtained the consulship was Publius Servilius Priscus Structus in 495 BC, and the last of the name who appears in the consular Fasti is Quintus Servilius Silanus, in AD 189, thus occupying a prominent position in the Roman state for nearly seven hundred years. According to tradition, the Servilia gens was one of the Alban houses removed to Rome by Tullus Hostilius, and enrolled by him among the patricians. It was, consequently, one of the gentes minores. The nomen Servilius is a patronymic surname, derived from the praenomen Servius (meaning one who keeps safe or preserves), which must have been borne by the ancestor of the gens.